Happy Friday crafty friends! 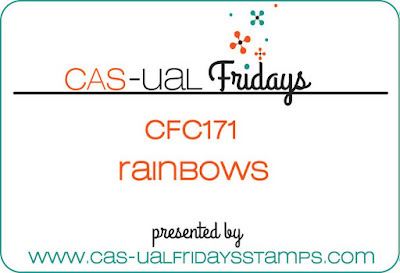 Time for another fun CAS-ual Friday's Challenge! We are all about rainbows this week! I absolutely wanted to play with the new Modern Petals border stamp set. I pulled out a rainbow of pigment inks and my Misti, I chose pigment inks because they are very vibrant and easy to wipe off on the parts of the stamp that I didn't want inked. To be able to have to room for a rainbow of colours I only inked up half of the stamp. I took some gold thread (it was actually my Grandmother's and there is still plenty of it left!) put my card together and finished it off with some gold Pretty Pink Posh sequins and added Glossy Accents to the Smile die cut! I had the pleasure of meeting Michele the owner and designer of CAS-ual Friday's during a business trip to Denver last week. She is a wonderful classy lady, love her product and I am happy I was able to put a face to the brand! Kim - I love your card!! The colors are great and what a great reason to use pigments! Duh. . . I never thought of it that way. ;) Your messy thread looks perfect too - hmmm seems like an oxymoron but it truly looks good. Your colors are just beautiful! Love this!